Every September, proud American Jewish parents upload photos to social media of their children leaving the house to start the school year. Friends and family marvel at how the child has grown. Most push the reality of the year’s costs to the back of their minds. The tuition crisis is particularly acute in American Jewish schools as there’s no system where local or national governments pay for secular studies. This leaves parents who value the religious day school experience in a sticky place. By sending just 2-4 children to private Jewish high schools, they could be setting themselves up for financial ruin. The hefty price for maintaining high school standards for both Jewish and secular departments is felt by children and parents alike. For children, because a day school syllabus makes it hard to get to the extra-curricular opportunities so many live and breathe for. For parents, because they’re working longer hours to cover costs— as the price of private Jewish schooling increases, wages do not. They also feel disenfranchised, wondering if there’s even a place for them in Orthodoxy if they cannot afford schooling. This marginalization, intended or not, can change the future of Orthodoxy. Exacerbating the issue is the worry that we have no clue if the situation will improve or deteriorate in the next generation. Thirty-somethings, not even a decade post college and just reaching career highpoints, are worrying how they will ever retire. They barely spend time with their families as it is. Like subsistence farming, the children are the retirement fund. An anonymous father of four, went viral last year bemoaning the “cost of religious life leading to financial ruin.” After making the calculations, he realized that unless he made a drastic change, he wouldn’t be able to put his children through college or retire; and he hadn’t factored in Pesach or a post high school year in Israel. His kids are now in the public school system and they supplement with Jewish studies at their local Chabad House. There are creative solutions for affordable Jewish education. You could join home schooling groups if your schedule allows or like Anonymous Dad send to public schools and supplement. Some states have voucher systems in place and the charter school system for all or part of the day can plug a gap. Despite the difficulties of a child participating in two frameworks, these fixes can work well—especially on an elementary school level. But there’s one path that Anonymous Dad nixed that might work for some. Naale Elite Academy, a high school program offering international Jewish teens full scholarships to live and learn in Israel, is a game changer - and an opportunity for Jewish teens to achieve academic excellence with a full curriculum in Israel, on a full scholarship - gratis! Anonymous father of four rejected Naale because not every child is capable of three years abroad. He also claims that going to public school is what our grandparents did and they managed fine; while that may be true, this option is far less palatable in 2018 that it was in 1918. Naale teenagers grow in self-confidence as they navigate Israel, become bilingual, integrate into Israeli classrooms and socialize with a global diverse crowd of teenagers. A child choosing Naale sounds like a kid with grit. Grit is defined as passion and perseverance but also incorporates work ethic, commitment, motivation and a growth mindset that can move on after disappointments. In research, grit ranked higher in indicators of future success than even IQ. 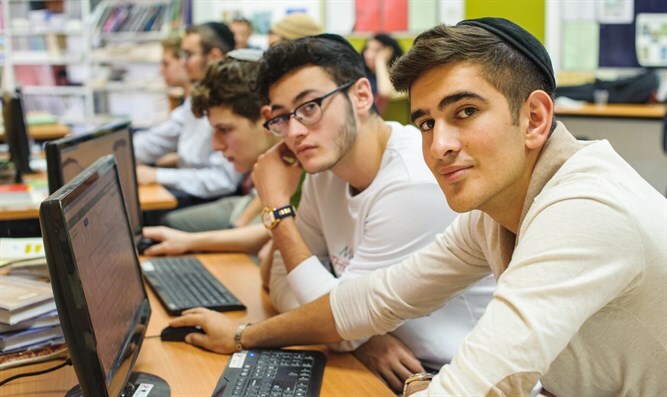 Naale students step out of their comfort zones, they have the grit to make mistake after mistake learning Hebrew and by the end of their time at Naale’s network of elite academies that grit speaks for itself. You don’t need a winning lottery ticket to achieve a work life balance for parents and happy, healthy children. The answer might be as simple as opening up to a possibility that benefits everyone. With money saved on tuition, many Naale parents visit their children on the other side of the pond to spend quality time together. In short, this international solution to a local crisis, is one worth looking further into!